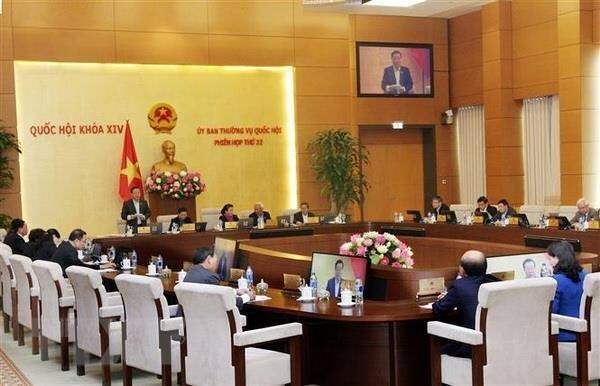 Hanoi (VNA) – The National Assembly (NA) Standing Committee will convene its 33rd meeting from April 10-18, according to a NA statement. During the meeting, the NA Standing Committee’s members will give their ideas on the NA’s law and ordinance building programme in 2020. They will debate nine bills, including a draft law on the amendments and supplements to a number of articles of the Law on Insurance Business and the Law on Intellectual Property; the revised Securities Law; and the Law on exit and entry of Vietnamese citizens. They will discuss the supervision programme of the NA and NA Standing Committee in 2020, as well as the report on the results of the supervision over the implementation of policies and laws on planning, managing and using urban land since the Land Law became effective in 2013 until the end of 2018. In addition, the members of the committee will consider the adjustment of administrative borders of five communes and the dissolving of a commune in Long Thanh district of southern Dong Nai province, as well as the establishment of five wards of Long Khanh township and the founding of Long Khanh city of Dong Nai. They are scheduled to approve a list of projects using the reserve middle-term public investment for 2016-2020 from the State budget, and the adding of a new list to the middle-term public investment for 2016-2020.